Aqua Service have 22 years of experience selling, installing and servicing Outdoor Spas and Pools. We are based in Nowra and cover all surrounding areas of the Shoalhaven and South Coast, including Jervis Bay, Wollongong, Ulladulla and Batemans Bay. At Aqua Service, we believe in local. We support locally made products and only stock Australian made pools, spas, swim spas, as well as pool and spa accessories. The Aqua Service team understands the importance of choosing a pool or spa that suits both your lifestyle and your budget. Our aim is to turn your pool or spa dream into a reality! Our showroom is based in Nowra and is open 7 days a week. We are proud to offer our clients a one stop shop for all things pool and spa! We can talk you through a range of new pool or spa options, as well as offer advice on chemicals, pumps, solar heating, filters and other accessories. The Aqua Service team are all passionate about what they do. Our customers are always our first priority and our goal is always to ensure you get the right spa or pool for you!. 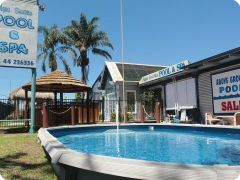 Looking for a Quality Pool or Spa in Nowra? Aqua Service are Your Local Pool and Spa Experts. Sales, Installation and Maintenance.